Tenacious and grippy, the Grand Traverse shoes take you over rocky ridgelines and down loose gravel paths. Their dual-compound sole transitions from wet surfaces to dry rock and help you keep your footing on loose and uneven terrain. EVA rubber and flexible construction through the midsole protects your feet on hard surfaces and through ambitious days. Uppers are suede leather and mesh with polyurethane overmoulding. Webbing heel locks for a precise, secure fit. Midsoles are moulded EVA with Poron cushioning and flexible strobel construction. TPU heels and rubber toe caps. 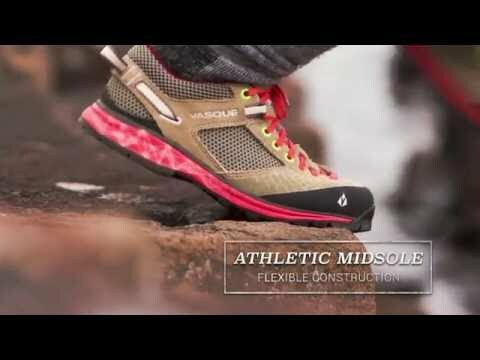 Outsoles are Vibram® Ibex with Idrogrip on the perimeter for good contact and grip, lugged Megagrip in the heels and forefoot to gain traction on loose terrain.